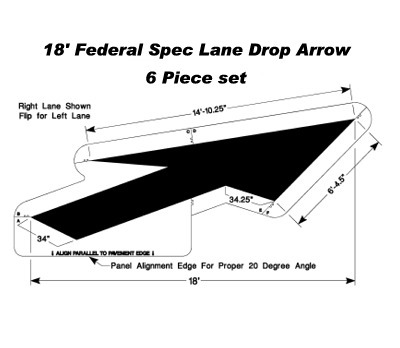 Federal Lane Drop stencil makes painting a lane drop on roads fast and easy. All Westwind's traffic control road and highway stencils are manufactured to MUTCD specifications. That means that you are in compliance whenever you use Westwind Graphics tough polyacrylic stencils. Individual state specified (DOT) stencils are also available. Directional arrow stencils, lane marking stencils and word stencils help you meet the marking requirements of any roadway. Cut from 1/8" (125mil) plastic with a LIFETIME warranty. Mark your roadways & parking lots with this Federal Lane Drop Arrow stencil (MUTCD Stencil) to help direct people more effectively and make bikers and drivers safer. Our Stencils are flexible plastic and can also keep your parking area, roads, streets, warehouses and other facilities attractive and clearly marked. Our stencils are more flexible and heavier than other stencils allowing them to conform to any smooth or rough surface that needs marking. You always get the sharpest, most accurate stencil markings possible. They make cleanup a snap: When the paint dries it simply flakes off! These Polyurethane stencils are tough and simply the best stencils made. They are the only stencils backed with a LIFETIME WARRANTY. Shipping: on large, fragile or heavy products is handled OFFLINE AND BILLED SEPARATELY (OR WE CAN USE YOUR UPS ACCOUNT NUMBER). We can make stencils as large as 30 feet in size. We are required to collect tax on all items shipped to CO.